Book now the best shore excursions in Olympia. High quality and safety at the lowest prices. If your are looking for Shore Excursion Olympia, book now the best guided tours at lowest price with Ancora Tours. Since 2003 we offer you official guides in english, transportation and travel insurance, all included. The highest quality at the lowest rates. In this shore excursion in the archeological site of Olympia you will discover the place where the Olympic Games were born. In fact, Olympia and its games were so sacred to the ancient greeks that during their celebration any war was suspended so that athletes and spectators could travel safely to the event. 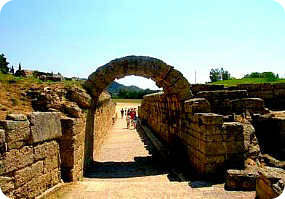 Extra Fees: Entrance to the archaeological site and museum is €9 per person. Over 6: €5. Under 19: free with identification. What’s eating: Moussaka: layered minced meat and eggplant, topped with béchamel sauce and browned in the oven. Souvenir: Replicas of the museum sculptures and bronze art. Starting from Katakolon, our shore excursion will reach the important archaeological site of Olympia in around 40 minutes. Together, we’ll dive into the sacred place where the ancient Olympic Games were started in 776 BC. Held in honour of Zeus, god of thunder and king of the gods of Mount Olympus, the games were not just an athletic event. Our knowledgeable guide will illustrate the religious and political meanings of the games. Nowadays, the Olympic Flame is still lit here every four years. In honour of Prometheus, who stole fire from the gods, a ceremony takes place at the Temple of Hera. The torch is lit using the power of the Sun’s rays, concentrated by a domed mirror. On the site, we’ll visit the Temple of Zeus, the Gymnasium, the stadium and the Hippodrome; which was used for chariot racing. Next, our shore excursion will visit the Archaeological Museum of Olympia. Inside, we can see the most important objects excavated from the site including the decorative sculptures from the Temple of Zeus and a statue of Nike, the goddess of victory, by sculptor Paeonius.